DAMAGE caused by a fire at Auscott’s Trangie site in central west New South Wales one day before the end of the ginning season is being assessed by insurers prior to the commencement of gin repairs in time for 2019 operations. The fire broke out in the early hours of September 14, and was attended by crews from NSW Fire and Rescue’s Trangie and Narromine stations. 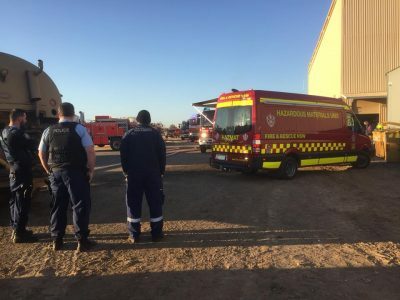 In a Facebook post, Trangie Fire and Rescue’s report said crews arriving at the scene found a large basement area well alight with a heavy fuel load of around 8000 litres of hydraulic oil, and were required to wear breathing apparatus to fight the blaze. NSW Fire and Rescue units, with assistance from the NSW Rural Fire Service, brought the blaze under control using firefighting foam and a “massive effort by all involved”. The small amount of cotton which could not be ginned at Trangie after the fire was transferred for processing to Auscott’s other Macquarie Valley facility at Warren. “We’ll be up and running next season for sure,” Auscott gin superintendent, Wayne Towns, said of the Trangie gin. Trangie is one of six gins owned and operated by Auscott in NSW.